Idyllically situated by the sea and near magnificent beaches, the apartments are integrated within the Prainha Tourist Village. The beach is approx. 300 m away and has direct access through lift. The center of Alvor is reachable in about 20 minutes walk. The complex is located about 65 km from Faro airport, 4 km from Portimão and 2.5 km from Alvor. The family-friendly complex offers a wide range of leisure options. In the main building there is a total of 61 tourist apartments. Facilities include 24-hour reception, 2 lifts, a snack bar and a mini market (April-October). The complex also has 4 restaurants including “Caniço” (April-October), built into the rocks and by the sea (accessible by elevator). You will also have at your disposal a TV room, Internet access (free), laundry service (extra cost), bike rental, playground, tennis courts (extra cost) and a car park. The hotel has 2 different types of apartments. The studios (maximum 2 people) include a bedroom, kitchen or kitchenette and bathroom. The 1-bedroom apartments (maximum 3 people) offer bedroom, living room, kitchenette and bathroom. All kitchens / kitchenettes have a refrigerator, electric stove, microwave and cutlery and crockery. All apartments come with individually adjustable air conditioning, safe (extra charge), pool or sea view, face south and have a balcony or terrace. Facilities include satellite / cable TV, shower and safe (extra cost) and free access to the gym and turkish bath (closed on Sundays). Located in Portimao, Luna Alvor Village is within a 10-minute drive of Alvor Beach and Alemao Beach. 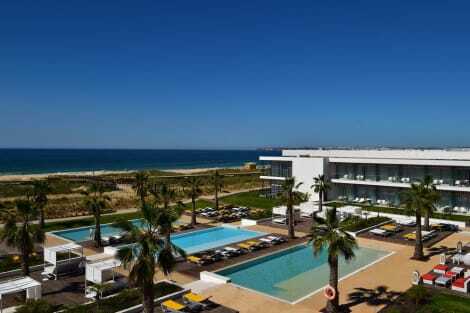 This 4-star aparthotel is 4.6 mi (7.3 km) from Aqua Portimao Shopping Center and 10 mi (16 km) from Palmares Golf. Located near the renowned village of Alvor, in the southern Algarve of Portugal, this charming property is close to the Alto Golf course and just a 5-minute drive from the beach. Praia da Rocha beach and Portimão are a short driving distance from the complex and both places have a great offer in terms of restaurants, cafes, bars and nightlife. The complex is composed by spacious and modern apartments with one or two bedrooms, with comfortable furniture and functionally equipped to provide a pleasant stay. The apartments have one or two bedrooms with twin beds each, two bathrooms, one with bath and one with shower, living room with sofa bed, LCD and DVD and kitchen with ceramic hob, oven, microwave, washing machine, dishwasher, refrigerator, extractor, blender and kettle. Living room and bedrooms are equipped with air conditioning. The apartments also have a small outdoor area. Ideal for a self-catering holiday, the simply decorated yet charming apartments provide all the necessary services and amenities to guarantee a memorable stay. Facilities on offer include 2 swimming pools for adults and 2 children's pools. Those travellers arriving in their own cars will find a large, free parking (outdoor and garage). Take advantage of recreational opportunities offered, including an outdoor pool, an indoor pool, and a sauna. Additional features at this hotel include concierge services, babysitting/childcare (surcharge), and gift shops/newsstands. The Alvor Baía Resort Hotel is comprised of 402 Suites, is located in the village of Alvor and enjoys an enviable location, about 1.5km from the Historic Center, the beaches of Alvor and 2.5km from the Golf Course.Surrounded by a green space of 69,000 m2 with several sports and leisure spaces from which stands out the magnificent swimming pool of 100m long, 2 Padle fields and children's fun zone (Pirate Ship).It also has a full support of services such as restaurants, bars, multipurpose room, gym, SPA with heated hydrotherapy pool, Turkish bath, sauna and massage. Complemented with outdoor parking and Garage.The Alvor Baía Resort Hotel brings together all the conditions and facilities for an unforgettable holiday in an All Inclusive Resort, ideal for the whole family. With a stay at Yellow Alvor Garden - All Inclusive in Portimao, you'll be near the beach, within a 15-minute drive of Rocha Beach and Alvor Beach. This all-inclusive property is 11.3 mi (18.2 km) from Meia Praia Beach and 9.2 mi (14.8 km) from Slide and Splash Water Park. With a stay at Pestana Alvor Praia Beach & Golf Hotel in Portimao, you'll be within a 10-minute drive of Rocha Beach and Alvor Beach. This 5-star hotel is 12.4 mi (20 km) from Meia Praia Beach and 9.3 mi (15 km) from Slide and Splash Water Park. Satisfy your appetite for lunch or dinner at the hotel's restaurant, Sunset, or stay in and take advantage of the room service (during limited hours). Relax with your favorite drink at the bar/lounge or the poolside bar. Satisfy your appetite at Restaurant Karma, a restaurant where you can take in the pool view. Snacks are also available at the coffee shop/café. Unwind at the end of the day with a drink at the bar/lounge or the poolside bar. Continental breakfasts are available daily from 8 AM to 10 AM for a fee. lastminute.com has a fantastic range of hotels in Alvor, with everything from cheap hotels to luxurious five star accommodation available. We like to live up to our last minute name so remember you can book any one of our excellent Alvor hotels up until midnight and stay the same night.